There are so many wonderful places to see and things to do in our world. Travelling to see God’s magnificent creation is one way to honor Him and to marvel at his love for us. His handiwork can be seen in the blues of the oceans, grays of the mountains and the greens of the valleys. His work can be seen in the lives of people in small towns and big cities. In the Southern Gospel industry, travel occurs everyday, whether it is on a bus with the rest of the band or in a car with a group of fans. Sometimes we get so focused on our destination, that we forget to enjoy the journey. I’d like to explore the journey with you in a new travel section of the magazine. Stay tuned as we enjoy some of the most beautiful natural wonders on Earth. We will also explore some of the interesting sights and quirky places our world has to offer. We all love Southern Gospel Music in my household and much of our lives revolve around the music, the people and the industry. But once in awhile you have to step back from your normal life and let loose with those you love, to experience things outside of your normal life of concert halls and church fellowship rooms. My family and I recently did just that and took a trip to Southern California. It was a grey day in typically sunny California. Between the grey skies and the damp ground were smiling and excited faces. My family and I, along with a good friend from Washington State, were about to experience Universal Studios Hollywood: The Entertainment Capital of LA. The film studio and theme park is located in the unincorporated Universal City, just northwest of Hollywood, California, and is one of the oldest and most famous Hollywood studios in existence. Originally, the property was created to offer tours of real Universal Studios sets, to reveal some of the movie making magic to an eager and curious public. From that initial idea grew what is the first of many full-fledged Universal Studios Theme Parks located across the world including locations in Japan, Singapore and the wildly popular, Universal Studios Orlando Resort in Florida. Universal Studios Hollywood is split into two different areas on separate levels, connected by several escalators. This area is popularly known as “The Starway.” The two areas are known as the Upper Lot and Lower Lot and house a variety of attractions. They house nine rides, seven shows, and a large outdoor play area, appropriate for younger children, unique attractions and food and beverage vendors and merchandise shops. The sky was still gray from the rain the night before, and it created an appropriately eerie backdrop for our first visit to the The Wizarding World of Harry Potter. The locals were all snapping photos as they weren’t used to seeing the tall grey, snow capped spires against an appropriately gloomy sky. Our moods were not dampened by a little rain; we are, after all Washingtonians. The Wizarding World of Harry Potter is a themed area at the park and where we started our visit. The area, modeled after the Harry Potter franchise, adapts elements from the film and the novel series by J.K. Rowling into a life-sized, themed town, complete with cobblestone streets and endearing British accents. Visitors are not only invited to sink their imaginations into the fictional world, but can’t help but be whisked away to the Hogswarts castle or the Hogsmeade shops that they’ve read about in the award winning books or watched on the silver screen. Being the scaredy cat that I am, I sat out on the first couple of roller coasters. I was happy that my littlest wasn’t tall enough to ride so I would have company. We were satisfied to walk around the world of Harry Potter, looking in the shops and posing with the adorably costumed characters, including the Hogwarts Express Conductor, while the rest of our party experienced the pulse-pounding rides. The next stop was the Studio Tour. The Studio Tour has been on my bucket list since I was a child. Even with a lifetime build-up, it didn’t disappoint at all. The beginning of the tour provided an amazing view of the back lot with Burbank in the background and an introduction to some of the sights we would be visiting. The guide was well informed and delivered the information in a fun and interactive way, including showing relevant movie clips and comments interjected by Jimmy Fallon. I don’t want to spoil any of the surprises, but I am too excited not share some of the exciting sights, sounds and shockers. 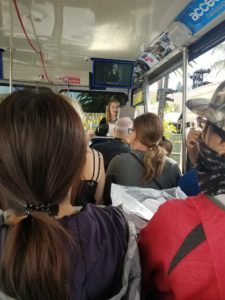 The tour is filled with a nice mix of real life information about your favorite movies and television shows, and special effects that make you feel like you are really a part of one of Universal’s thrilling movies. We rode the trolley through the front lot, where we had to be quiet because of filming that was taking place. We saw the Star Wagons where the stars go to get dressed and hang-out. They were filming The Mindy Project and we had to be quiet during the filming. We rode past some of Hollywood’s most famous cars including vehicles from hit movies such as Back to the Future, and some of our favorite television shows like Knight Rider and Magnum PI. 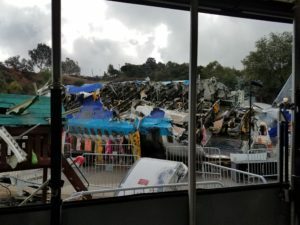 One of the most interesting parts of the studio tour was the airline crash set of Steven Spielberg’s The War of the Worlds starring Tom Cruise and Dakota Fanning. The airplane in the movie was a real 747 and the realistic look of the crash site was both eerie and fascinating. We were able to travel the world in our little tram. From the sets of Little Mexico to New York City, we saw it all without leaving Southern California. And we were able to travel back in time, to the Wild West and ancient Australia. We even had an encounter with a not-so-friendly dinosaur. We also came face to face with King Kong 360 3-D created by Peter Jackson. It’s the world’s largest, most intense 3-D experience. This was only one of the unnerving incidents that lead to the heart pounding finale. You better hold on tight for the Studio Tour’s grand finale, Fast & Furious – Supercharged! Here you will ride along with the all-star cast from the hit movies, including The Rock on an exhilarating high-speed chase that exceeds 120 miles per hour and catapults you into the high-stakes underworld of fast cars and international crime cartels. You will see and feel the action! You’ll be engulfed in a world of cutting-edge, hyper-realistic special effects, including 3D-HD imagery projected onto the world’s most expansive 360-degree screens! It is an experience that you have to experience to believe. Unfortunately, words can’t do justice to the experience, but I would encourage you to experience it yourself. After our tour, we decided to walk around Downtown Springfield. It is an authentic replica of the city featured in the animated series, The Simpsons. There you will find Krusty Burgers and donuts good enough and BIG enough to satisfy even Homer Simpson’s appetite. There are plenty of irresistible photo opportunities. We grabbed a quick photo with the friendly Homer Simpson before we headed into the highlight of the area, The Simpson’s Ride. The Simpson’s Ride features America’s favorite animated family and their friends. These colorful and familiar characters will lead you on an epic adventure through the fictitious town of Springfield on this virtual roller coaster. I am not a roller coaster fan, but I do enjoy the virtual rides. After our adventures with Homer, Bart and company, we headed over to experience Despicable Me Minion Mayhem. Here we joined Gru, his daughters and the mischievous Minions on a heartwarming and hilarious 3-D ride. Guests start the adventure in Gru’s home, where you’re recruited for his latest scheme – one where you’ll become an actual Minion. Don’t believe me? You’ll have to experience yourself! After making it through Minion training, things don’t go as planned! Within moments, you’re launched into an unforgettable trip through his super-villain laboratory. The laughs keep coming after the ride with an interactive, Minion-inspired dance party. Then, plan to visit a re-creation of the first Minion film’s memorable seaside carnival, Super Silly Fun Land. This Fun Land is an all-new elaborate play zone adjacent to the Despicable Me Minion Mayhem ride. This colorfully themed, interactive Minion-inspired outdoor venue is a literal interpretation of the seaside carnival from the popular movie, Despicable Me. The area is designed to entertain guests of all ages with more than 80 different water-play features. A nearby dry zone invites guests who don’t want to get wet to climb, jump and slide. Nearby is the Minion-themed ride, Silly Swirly Fun Ride, which was my littlest daughter’s favorite ride of the day. This swirly ride will soar and spin guests around for a 360-degree view of Super Silly Fun Land, aboard a fleet of uniquely styled ride vehicles. It is probably the best ride for the five and under crowd in the whole park. Another fun spot in Super Silly Fun Land is the memorable Super Silly Space Killer arcade game. Reminisce about when Agnes won her lovable stuffed unicorn that was so fluffy! You can also try and beat the odds as you vie to win Minion game prizes and a stuffed unicorn of your own. Some famous Minions as well as Gru hang-out in this area and are more than willing to pose with guests for pictures. We saw one Minion near the Super Silly Space Killer game and Gru and more Minions near the Mayhem ride. After this adventure, we made our way towards the Shrek 4-D attraction. On our way there, my girls spent some time with Fiona and Donkey. Fiona was beautiful and everything you think a princess should be and Donkey was of course, hilarious, as you would imagine. It was intriguing because though Donkey was a fully animated character, he was also interactive and had a nice conversation with my oldest about Seattle weather and even had a few one-liners to fit the occasion. We spotted Shrek himself there later in the day, but weren’t able to say hello since we were headed to another exciting attraction. We headed to Shrek 4-D™ — the attraction that puts you right into the action with hair-raising, eye-popping, effects. The virtual ride features an original 3-D film starring the vocal talents of the movies’ original cast. You enter the ride, which I might even classify as an interactive show, by spending a little time in Lord Farquaad’s dungeon. There are plenty of things to see and experience while you wait, including an introductory movie that sets the stage for the rest of the ride. After the introduction is complete, you will enter into a large theater, donning your special 3D glasses which really bring the show to life. Once the show begins, you will not only see and hear the show, but you will actually feel the action. The seats move along with the action on the screen. Hold onto your seat during the race scene. You will be sprayed with mist and water, where appropriate for the show too. You will also experience wind and a special surprise that will make you squeal and giggle. There are plenty of shows to keep you entertained while at Universal Studios Hollywood too. The Special Effects Show was especially interesting to me as it gives you an exclusive behind-the scenes look into how some of the special effects from your favorite blockbuster movies were created. The Special Effects Show features some pretty cool stunts, practical effects and cutting-edge technology. One of the highlights is when a couple of Hollywood’s best working stunt performers recreate the sounds, sights and illusions that fool the cameras to create unforgettable moments in popular films. Viewers also learn the secrets behind realistic physical combat sequences, horror scenes, zero-gravity space travel and even a live animation demonstration! Through professional demonstrations and audience participation, movie-making magic becomes a truly unforgettable, surround-sound experience. You might be asked to leave the line while waiting, in order to take a role in the show. If you want this experience, be sure to arrive early and raise your hand quickly. 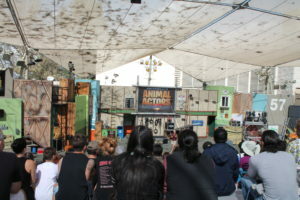 Another show worth seeing is the Animal Actors Show. This was my youngest child’s favorite of the day. The animals in the performance are the actual actors used in popular television shows and movies, including the real Beverly Hills Chihuahua and the owls used in the Harry Potter movies. You will see your favorite scenes from The Secret Life of Pets re-enacted, and watch exclusive film content. The show is sweet, entertaining and interactive with audience participation. The animals range from small little critters to large dogs and birds. If you have time, make your way towards the stage after the show, where you can see the animals up close and even pet these furry little celebrities. Water World was my favorite part of the entire day. There was just the right blend of campy antics and realistic acting. Sit in the front, in clearly labeled seats, if you want to get wet. Sit a little further back and you should stay perfectly dry. The live show is based on the movie, Water World, where the entire world has been engulfed in a Noah-esque flood. Only a few survivors remain and only one knows where to find dry land. You will experience a tidal wave of explosive action and breathtaking stunts. There is no doubt in my mind why this is Universal Studios’ number one rated show. 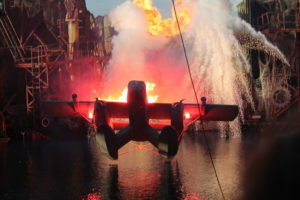 The adventure surges to life with jumping jet-skiers, perilous plunges from high above your head, firefights, massive explosions with real fire, and an in-your-face plane crash you need to see to believe. 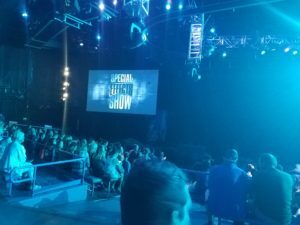 The show features a new set and a cast full of working actors and stunt people from some of Universal Studios most popular shows. Be sure to keep your eye out for SpongeBob SquarePants, Curious George and Scooby-Doo with Shaggy. All these beloved characters hang-out in the Upper Lot. There are plenty of things to do in the lower lot too, though it is smaller than its upper counterpart. The main attractions are the Jurassic ride, Mummy: The Ride and Transformers. 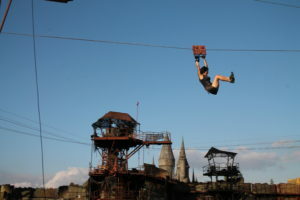 But if you are with a little one who isn’t tall enough or who doesn’t want to ride some of these more thrilling rides, there is still plenty to do in the area. There is a Jurassic play area, a few characters and some food vendors to visit. The Lower Lot is where we spotted Dora the Explorer and her beloved Backpack, whose eyes really moved. My daughter loved getting a chance to get her photo taken with these popular characters. My littlest and I were not able to enjoy the raft adventure to see the dinosaurs in their natural jungle habitat or experience the narrow escape from a 50-foot T-Rex on the Jurassic Park Ride. The rest of my party did, however and could stop talking about it. The ride is based on the book and movies of the same name. Their favorite element of the ride? The exhilarating 84-foot plunge to safety that happened as the finale. The adventure continued just outside of the ride at Raptor Encounter. Guests are able to experience a live encounter with one of Jurassic Park’s most famous inhabitants, a nearly nine foot tall Velociraptor. You can simply sit back and watch it roam around the area, or get in close for a photo if you dare. My littlest was brave enough to stand-by this intimidating fellow for a photo. One ride in the lower lot that my entire party enjoyed together was Transformers: The Ride-3D. Based on the popular movie franchise, this mind-blowing Transformers adventure puts you smack in the middle of the ultimate futuristic war zone. It is an immersive, next-generation thrill ride blurring the line between fiction and reality, drawing you into an ultra-realistic, heart thumping experience. The ride fuses HD 3D media and flight simulation technology that is part ride and part virtual world. This epic ride creates an experience unlike anything this planet has ever seen. You will fight alongside Optimus Prime and will try to survive as you protect the AllSpark from Decepticons over four stories tall. The future of the human race is counting on you! It is easy to become immersed in this thrill ride and the story-line. With 3D glasses on, you will be convinced that the characters are really there, fighting with (and against you). 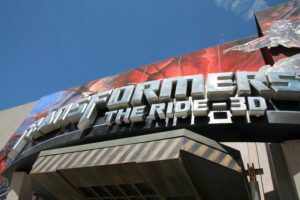 Outside of Transformers: The Ride 3D was a meet and greet with the most famous Transformers. Optimus Prime, Bumblebee and Megatron can all be seen here and are on a fixed schedule which is posted so you can plan to meet your favorite one. We were able to hang out with our buddy, Bumblebee, for a bit. It is fascinating to see this robot, who is controlled by an inconspicuous team member hidden in the corner with a tablet, interact with the guests. Revenge of the Mummy: The Ride is also located on the Lower Lot. I missed this ride, but those in my party who did ride it said it was one of their favorites and rode it twice. Apparently, the ride closed for refurbishing shortly after our visit, so double check to make sure it is open before you go to Universal Studios. Riders are catapulted at speeds up to 45 miles per hour in virtual darkness. Guests will also notice many Egyptian hieroglyphics covering the walls at various places within the ride. These hieroglyphics spell out real words and ancient warnings. Check out the website www.UnviersalStudiosHollywood.com for more information and park maps. We loved having the Front of the Line passes and would highly recommend them to anyone planning their own trip to Universal Studios. Of course, they cost nearly twice as much as the regular ticket. but vacation hours are precious and you don’t want to spend your time standing in line. We were able to do the entire park in one day. Plus,it sure made us feel like rock stars when we were able to scoot on by everyone in line and waltz right to the front. I wish all theme parks offered this special perk. Another thing that Universal Studios, Hollywood does better than other parks is keeping the theme of each distinct area. The operators of the rides and attractions were costumed and in character. For instance, the operators for the ride Transformers were dressed in futuristic military gear, while the cast members in other areas wore costumes more appropriate for their roles. Universal Studios Hollywood offers a far more authentic experience than similar parks. The actors in the shows are from real television programs and movies. Even the ride attendants and tour guides stay in character to add to an element of excitement and authenticity to the experience. Being a historian, I loved the historic elements of Universal Studio, Hollywood. The Studio Tour was full of historical facts and artifacts, perfect for a movie buff or anyone interested in cinematography. There were also authentic movie props and artifacts on display around the park. I enjoyed this educational aspect to the visit. Universal Studios is unmatched in their special effects. Since this is an area that they do best, special effects are a part of almost every show, ride and attraction. This is rather unique to this franchise. I loved the trickery of the effects and enjoyed the element of surprise. Most theme parks focus more on the ride, where Universal Studios concentrates on the overall experience. I really appreciated the clear descriptions of the rides posted at the entrance of each attraction. As a parent (and a scaredy cat), I was able to easily see which rides would be appropriate for me and my family. I liked the clear instructions, clearly labeled rules and restrictions, as well as the recommendations. It took a lot of guesswork out of trying to decide whether a ride was appropriate for my children. The cooling stations were refreshing. SoCal can get hot, and these cooling stations, which are large fans and misting areas, are the perfect way to cool down. The weather warmed up by afternoon and we were happy to have a place where we could enjoy some cool air and mist. We found the staff more personable and friendly than at similar theme parks. When you spend a lot of money to create a special day for your family, you don’t want it ruined by grumpy employees. I did not have one negative experience with any team member during our visit. Save money by buying Season Passes at Costco. Although they aren’t available all the time, you can find a deal on Season Passes to Universal Studios. For about the same price as the one day admission, you can purchase a season pass at the big box warehouse store. 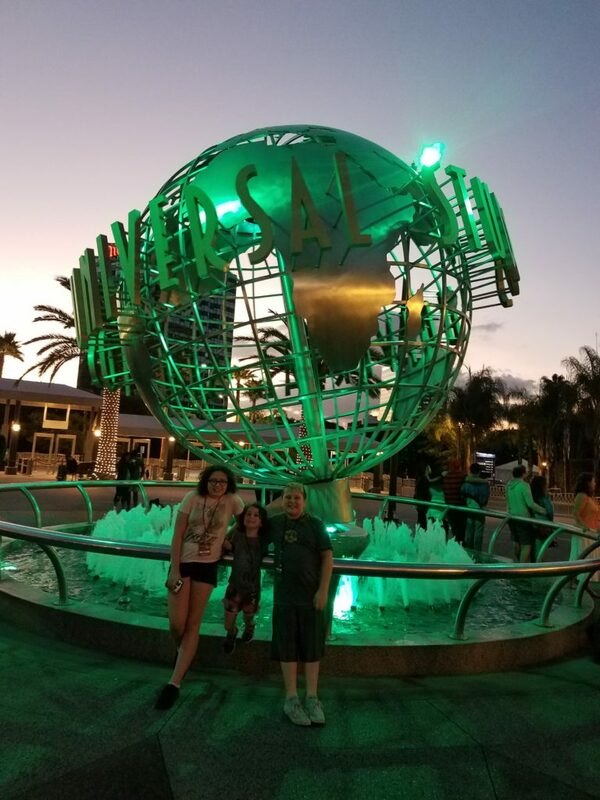 If you live within driving distance of Universal Studios Hollywood, or plan on spending more than one day at the property per year, you will save a lot of money by purchasing the season pass. Buy the Front of the Line passes. These special tickets are good for one front of the line experience for each ride and show. You will be given a plastic card on a lanyard to wear around your neck. These special passes make a good keepsake too. Arrive ahead of park opening. Remember that parking and walking into the park, going through security and standing in line to enter the park will all take time, and you don’t want to take that time away from your park experience. To maximize your day at the park, make sure your car is fueled, you have everything you will need in one easy to carry bag and that you have a map or GPS to get you to the park without issue. If you want to see some top celebrities interviewed in person, check-out a taping of EXTRA, a leading entertainment-news television show. Check the calendar on the Universal Studios website to find out which celebs will be in the park filming at the time of your visit. You can often spot Extra with Mario, Charissa & Tracey Live! in front of the Globe Fountain on weekdays. Celebrities don’t appear every single day, but when they will be filming on site, their times and locations are noted on the schedule for guests to view. “Starway,” the series of escalators that connect the Upper Lot and the Lower Lot, is very long. It will take you about 10 minutes just to get from one lot to the other. The travel time can be even longer during peak hours. Avoid multiple trips between the lots by doing everything in the Lower Lot on a single trip. The Lower Lot tends to be less crowded in the morning, so I would recommend going there early. Rumor has it that this lot stays open about 15 minutes later than the Upper lot, so you could also consider heading there at the end of the day. Strollers are easily transported on the escalators. Head to the Studio Tour early. This is the most popular attraction in the park and will fill-up quickly. If you buy Front of the Line passes, you should be able to hop on a tram without a wait. If you don’t, then, not only are you not listening to me, but you will have to wait in line. Get there early to avoid the crowd. Buy the popcorn bucket early in the day. For one low price, about six dollars, you can get free refills for the entire day. There are three different stands where you can refill your popcorn throughout the park as long as you hold onto your receipt. For under six dollars, you can have snacks for the entire day, plus a reusable bucket (which came in handy at the beach the next day) as a souvenir. Same advice is true for the pop, if you are okay with your children loading up on soda. For $10, you get a large plastic cup, with a built in straw. For only .99 per refill, you can refill your cup for the rest of the day. It turns out to be a good deal, especially on a hot day. If you want to buy souvenirs, consider buying your Universal Studio Hollywood gear at Universal CityWalk Hollywood. This area is open before the park and remains open well into the night after the park closes. CityWalk is a three-block area filled with entertainment, dining and shopping. You might also find live music! You won’t have to waste your park time looking for the perfect souvenir because you can always pick-up something special after closing. If you are visiting the park with small children, you will definitely want to hang-out with the Minions. It is the most kid-friendly part of the park. Various minions and Gru are on-hand for photo ops and fun exchanges. You will also likely ride the Silly Swirly Fun Ride more than once. My six-year-old was only scared once during our visit. During a Jurassic moment on the studio tour, my daughter snuggled into me and hid her eyes. She doesn’t scare easily, so if you have a child who does, you will want to assure them that what they are seeing and experiencing is all special effects and not real prior to getting on the studio tour. Otherwise, the rides are clearly labeled by height restrictions, which also takes into consideration the age of the rider. She sat out on the Jurassic ride. She wasn’t tall enough for one of the Harry Potter rides and Mummy. Bring a stroller. Seriously. Bring a stroller. The biggest challenge for navigating the park with a stroller was The Starway escalators, but they were easily to maneuver. The stroller parking is more clearly marked and more conveniently located than at other parks. The stroller became an asset when my daughter got tired or over peopled. It also allowed the rest of our party to continue walking around the park while I sat comfortably and had a snack. Which leads me to my next tip…. Bring small snacks. We brought beef jerky, breakfast bars, potato chips and small candy. We actually brought some sandwiches, chips and water too, for lunch. It was nice to be able to sit down under an umbrella and enjoy a quick meal before heading to our next adventure. Bringing food will help your day go more smoothly and will save you money. The food in the park is within reason, so plan to splurge on one or two treats. Go to the animal actors show. Children can see the animals up close and may even be able to pet them. It’s a nice break to be able to sit and relax while your child is entertained by cute and fuzzy little friends. The next time you visit Southern California, whether it is to attend a concert or convention, or just for fun, plan a day to visit Universal Studios, Hollywood. It is a unique experience that marries history with the future, and excitement with old fashioned, family fun. 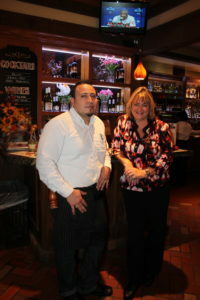 From the moment we walked into the front doors of Mimi’s Cafe, we felt a warm welcome from the staff. It wasn’t the type of welcome that you get when you walk into a fast food place, where an unenthusiastic worker flashes a weak smile and mutters a robotic, “welcome.” This welcome felt genuine and set the mood for a fantastic meal that not only warmed our tummies, but also our hearts. 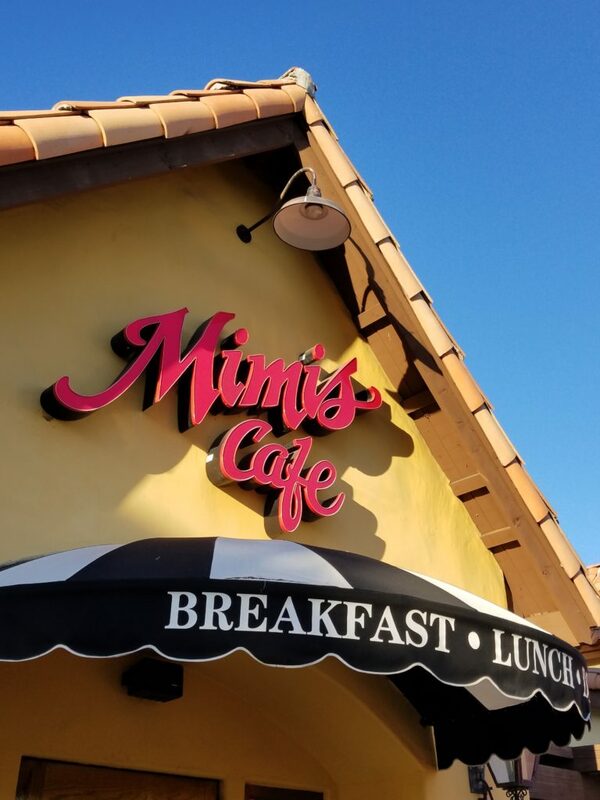 Originally headquartered in Irvine, California, less than 20 miles from the Anaheim location we visited, Mimi’s Cafe now has 97 locations in 18 states. 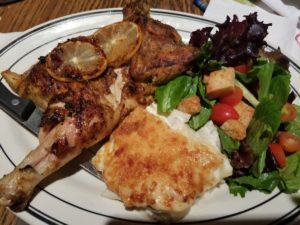 It serves French and American food that is homey with a flare. When you’re traveling, there is nothing like a home-cooked meal to make you feel all warm and fuzzy. It features a modern decor that is comfortable yet eye-catching. We were seated in a spacious booth that offered enough privacy to carry on conversation with our children. The decor hinted to the French-inspired menu, but blended well with the family friendly vibe of the restaurant. We started our meal with a spinach and onion dip served with nacho corn chips. 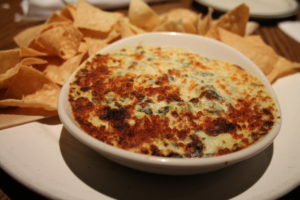 Mimi’s Cafe’s Warm Spinach Artichoke Dip, did not disappoint. The appetizer came with a large portion of rich and creamy dip made with aged Parmesan and chopped kale. It also came with a hearty amount of warmed house-made tortilla chips. We had the opportunity to try the Fried Chicken and Waffles from the All Day Breakfast menu. I’m a northerner and am a little embarrassed to say that I’ve never had this southern favorite. But my friends in the South will be happy to hear that I am now a believer. I will no longer give you a funny look when you tell me you are going to have waffles and chicken after a Southern Gospel concert. 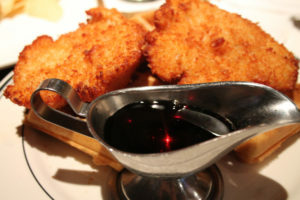 It came with two large pieces of hand-breaded chicken breast, two large buttermilk waffles and warmed maple syrup. It was delicious! The Slow-Roasted Turkey Dinner was tender and melted in our mouths. 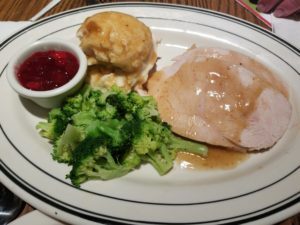 The slow-roasted turkey was served with mashed potatoes, gravy, cornbread dressing, fresh vegetables and orange-apple cranberry relish, which, by the way, was loved by my children who don’t typically enjoy relish. The meal is large, but if you want to add a Mimi’s House Salad, Caesar Salad or a cup of soup, you can make it even heartier. This is the perfect dinner for anyone looking for some home cookin’. It would also be a perfect holiday meal around Christmas or Thanksgiving for anyone not going home for the holidays. My littlest daughter ordered the same thing she always orders whenever it is on the menu, Chocolate Chip Griddlecakes. 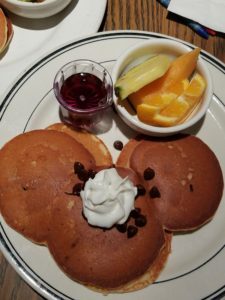 To her delight, not only did she receive two large fluffy buttermilk pancakes with a gooey pile of chocolate chips and a dollop of whipped cream on top, but the pancakes were shaped like Mickey Mouse’s head. What a perfect way to start our week of Disneyland fun. Her meal also came with a cup of fruit, including melon and oranges. The portion size was large, so I felt comfortable stealing a bite. The pancakes were fluffy and tasted perfect and warm enough to melt the butter piled on top. Apparently she loved it too, since there wasn’t so much as crumb left on her plate. The ultimate comfort food, Macaroni and Cheese, is amped up at Mimi’s. It is pure and traditional enough to please the die hard mac-and-cheese lover, but unique enough to intrigue those looking for something special. The Chicken Tillamook Cheddar Mac is to die for and features pulled chicken in a rich Tillamook Creamery cheddar sauce with crumbled bacon, penne pasta and Parmesan crust. Tillamook is a familiar brand from the Pacific Northwest and is considered to be a premier cheese. I knew, just by the name, that this was going to be a crowd pleaser. It was creamy, but also had a little bit of crispness, as it was baked. There was a hint of bacon, crumbled on top, but the predominant taste was the gloriously creamy cheese. For dessert, we shared the Crème Brulee Cheesecake, which was amazing. 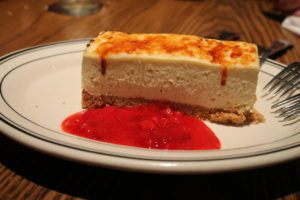 The deep dish cheese cake featured French vanilla buttermilk and a flaky, hand-made thick graham cracker crust. After a hearty meal, we were only able to share one cheesecake, but the portion size was ample enough to fill in any empty spots in our tummies. I love cheesecake and crème brulee, so this was a winning combination for me. I particularly loved the caramelized sugar on the top. The portion sizes were large on all the meals, which was perfect for these weary travelers. We went back to our hotel with very full tummies and even some food to spare. I want to give a big “Shout-Out” to our server, Willy. He was the most attentive server I think I’ve ever had. He brought us plate after plate of piping hot food and didn’t let our drinks go dry. He served with a smile and friendly anecdote, but didn’t intrude on our privacy. He turned serving food into an art form. Even my 11-year-old daughter was impressed with his service. She said that Willy was calm even though he was taking care of us and several other tables simultaneously, a fact that I was shocked at. His attentiveness made me believe that we were his only guests. If you are visiting Disneyland for the Gospel History Music concerts in February or just having quality family time, consider making your way across the street to Mimi’s. You can sit down in an air-conditioned dining room and enjoy a little break from the hectic pace that is Disney. And with the prompt service and close proximity to the park, you will not feel as if you are losing a lot of precious time. I’d like to personally like to thank Amy Freshwater for arranging our visits and the Manager, Janet Ingram for overseeing it. And thank you to Willy for outstanding service. I wish there was a Mimi’s Cafe in my home state of Washington. 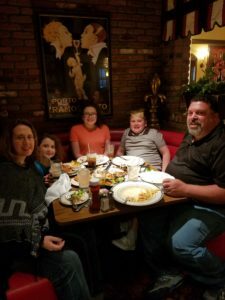 When we are looking for a place to eat, someone in our family will always say, “Mimi’s,” even though we know the closest one is over a thousand miles away. 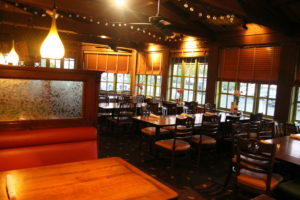 Mimi’s Café in Anaheim is located at 1400 S. Harbor Blvd. (714) 956-2223. For a full list of locations, visit Mimiscafe.com. Disclaimer: I may have been provided a complimentary service or product in return for my honest review. All thoughts and opinions expressed in the review (s) are my own and have not been in any way influenced by any person or act.